Major strides in technology continue to be made with each passing year. These accomplishments are especially noteworthy within the realm of mobile devices. One company that consistently showcases how far technology has evolved is Samsung Electronics. 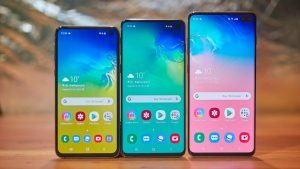 In their newest cellphone model, the Samsung S10, this Korean tech giant has implemented high-tech features used in medical imaging devices and GoPros. A unique aspect of this device is the ultrasonic fingerprint scanner that is built into the phone’s display. Just as diagnostic sonography (ultrasound) uses high-frequency sound waves in order to examine the finer details of a developing fetus, the S10 utilizes 3D mapping to allow the device to detect the unique ridges and patterns of your fingerprint. The feature is even able to monitor an individual’s heartrate, blood flow, and fingerprint tissue. Therefore, would-be-hackers will find certain tricks such as using pictures or an outline of a user’s fingerprint useless when trying to bypass security. For the vloggers out there, recording high quality content is made even easier with the S10’s professional-grade camera. The camera option called “Super Steady Mode” allows the user to reduce shaky cam and stabilize their recordings whether they are skiing down a mountain or involved in an aggressive soccer match. Samsung has also found ways to share the S10’s power supply with other Samsung devices. Wireless PowerShare uses charging coils that are prebuilt inside of the back of the phone to emit an electromagnetic field to charge nearby compatible electronics. No word on how fast this type of charging will be, though. Alongside its newest phone, Samsung has also released its latest line of wearables—perfect for syncing! The splash-resistant Samsung Galaxy Buds now come with a built-in touchpad attached to the earpiece itself. A user is able to skip songs and end calls without using a wired connection or accessing their phone. The earbuds also come with dual microphones that automatically adjust in order to adapt to the user’s external environment. For example, if the user is in a noisy setting, the inner microphone is activated inside the ear canal to allow higher quality of sound. The lightweight and slick design of the Galaxy Watch Active is a pleasant surprise released by Samsung—especially after the recent criticism regarding the S10’s mic and earpiece notches. This new wearable has eliminated the rotating bezel (round border) that encompasses this device, allowing for a much wider screen than its predecessors. This bonus feature allows setting such as “do not to disturb” to automatically transfer from your watch to your phone. Samsung’s latest line of products has clearly demonstrated its ability to punch above their weight in the world of mobility. Their ability to provide comfort, convenience, and commitment towards their customer’s needs is what will continue to keep Samsung a top dog in the technology industry.